Because warm weather isn’t only about rosé. Temperatures are rising but that doesn’t mean you have to switch to rosé. Red wines still deserve a place on your table, whether that table is indoors or out. The most refreshing way to make red wine a part of your summer routine is to chill it. Not all red wines should be chilled, though: Chilling full-bodied, high tannin, high-alcohol reds like cabernet sauvignon will make them taste astringent and metallic; and savory wines like syrah that have lots of leathery, earthy, or spicy flavors will not drink well when chilled. The best red wines to chill are naturally light in body, low in tannins (the compound found in the seeds, stems, and skins of grapes that can make your mouth feel dry and prickly), and are fruity. Chilling reds like these brings out their liveliness and minimizes the perception of alcohol. (That’s the warming sensation that alcohol in wine can bring and it’s not something we usually desire when it’s hot out!). The best way to chill a bottle of red for summer sipping? In an ice bucket or cooler. If you can’t tuck the bottle into ice, simply put it in your refrigerator for 45-60 minutes before you plan to drink it. Here, five red wines that are perfect chilled. A fantastic, easy drinking wine from Sicily, frappato is brimming with wild strawberry and red raspberry flavors and aromas, and has an incredibly smooth texture. Try Try Tami By Occhipinti Frappato 2017 ($21.99) or Il Frappato, Valle dell’Acate 2017 ($19.99). Embrace the spirit of Italy in the summertime by pairing a chilled glass of frappato with a fresh summer pasta. “Life is too short to drink bad wine,” stated Johann Wolfgang von Goethe. Celebrating excellence in wine is the rally cry for Vinitaly, the largest wine exhibition in the world. Attended every year in Verona, Italy, by producers, importers, restaurateurs and journalists, all participants are eager to share and discover new trends and exchange ideas on this internationally recognized Italian tradition of excellence. Once again the city of Romeo and Juliet is the world’s wine capital this week, where from April 15-18 Verona is transformed into a prestigious world-class showcase of the best of the best in Italian wines. Milan, March 7th, 2018 – its name is Bellifolli and it is the new project of the Sicilian cellar Valle dell’Acate, a winery present for six generations in the world of the island’s wine. The project will be illustrated today in an advance presentation at the Palazzo Serbelloni in Milan. A brilliant line of wines created after reflecting on the success of Frappato both in Italy and on International markets; a wine which is fresh and light. A red wine which also goes well with fish and is a fine match to many international dishes. And is much liked by the younger generation. Bellifolli synthesizes the character and the contrasts of Sicily and the Sicilians: the beauty and the moments of folly, the light and the shade, the sea in turmoil and the warm sirocco breeze – all of this which, together, has created an identity which can be seen in one of the marvels of the island, its spectacular Baroque architecture. “As a child I walked through the streets of our cities protected by the “mascheroni”, the fantastic or grotesque faces which jut out from the facades of the palaces. We Sicilians have lived with them for centuries, they are part of our daily life. They narrate, murmur, observe – comments Gaetana Jacono, proprietor of Valle Dell’Acate –and adds that Interbrand, the principal brand consultancy firm on a global level, has known how to interpret our concept with much intelligence, giving it an up to date style and approach. 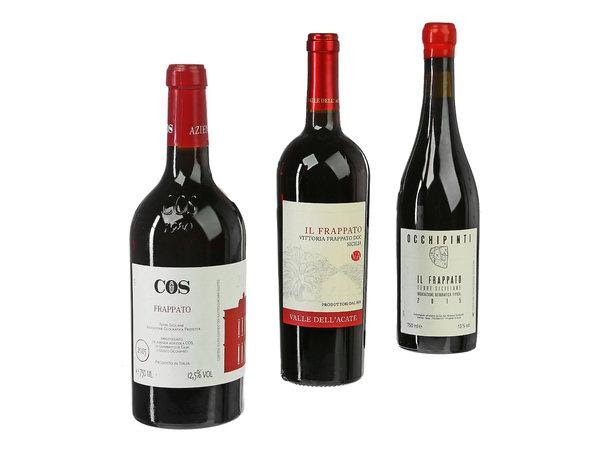 Here are four wines – Syrah, Nero d’Avola, Insolia, Grillo & Chardonnay – which are marvelously Sicilian and have obtained the effect we hoped for on the younger generations, that of appreciation and total surprise”.